Representatives of Civil Society, Sierra Leone. A strong and freely operating civil society is crucial for successful and stable democracies and must be given the space to carry out their vital functions, the United Nations emphasized today, as it marked the International Day of Democracy. 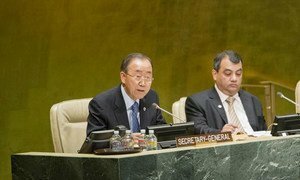 “Civil society is the oxygen of democracy,” Secretary-General Ban Ki-moon said in his message for the Day, observed annually on 15 September. “We see this clearly in the world’s most vibrant and stable democracies, where Government and civil society work together for common goals,” he continued. Yet, Mr. Ban pointed out, freedom to operate for civil society is diminishing – or even disappearing. An alarming number of governments have adopted restrictions that limit the ability of non-governmental organizations to work, or to receive funding, or both. That is why, he added, the theme of this year’s Day is space for civil society. “Unfortunately,” they stated, “space for civil society is shrinking rapidly today, both in countries with no democratic tradition and in ostensibly democratic countries. There is a growing disconnect between elected officials and the people. “We see this disconnect manifested in the recent surge of large protest movements throughout the world. People perceive a failure of governance and democracy, and protest is often their last resort in making themselves heard,” the independent UN experts said.